BEIJING --- The "Airborne Platoon" competition of the International Army Games 2017 held by the airborne troops of the PLA Air Force concluded on August 10, 2017. During the 15-day competition, Chinese airborne troops competed with teams from Russia, Kazakhstan, Iran, Morocco, South Africa and Venezuela, and were the final champion by winning first place in 11 out of 12 events, followed by the teams from Russia and Kazakhstan in the 2nd and 3rd place. This was the second time that the Chinese airborne troops demonstrated their strength after receiving the inspection by President Xi Jinping at the Zhurihe comprehensive training base on July 30, 2017 as an elite force in the joint operations system of the People's Liberation Army (PLA). In early May this year, the 15th airborne corps was reorganized into the " corps of PLA airborne troops", and the former division units affiliated to it were split into several brigades. Meanwhile, the former special operations regiment was expanded into the special operations brigade, while the new combat support brigade and air transport brigade were also formed. Moreover, two regiment-level units will be integrated with the Academy of Airborne Troops to form a new troop unit. The establishment and commanding system of the new airborne troops also have been adjusted accordingly. Public information shows that before the reform, the 15th airborne corps adopted the four-tier commanding system, including corps, division, regiment and battalion. After the reform, the commanding system is flattened to three tiers, including corps, brigade and battalion, which complies with the "division to brigade" trend in PLA's overall reform. Military experts held that the "corps - brigade - battalion" system is more efficient than before and the "special brigades" can enhance combined combat capability. According to Zhao Jinjun, deputy chief of staff of the airborne troops, the fewer levels of command, the shorter time of response, and the faster delivery of troops. The reform of the establishment and commanding system is fundamentally aimed to improve the fast response capability of the airborne troops. It's worth noting that after the reform, the airborne troops cancelled the designation of "15th corps" that carries a strong imprint of the Army to further reinforce the concept of an independent arm of service within the Air Force. Military analysts believe that in addition to the reduction of commanding levels and change of designation, another highlight of the airborne troops reform is the expansion and elevation of several "special brigades". First of all, the special operations regiment that was directly affiliated to the corps were expanded into a special operations brigade. While increasing the special forces in the airborne troops, this also indicated one of the future directions of the airborne troops - special operations. This brigade mainly carries out special penetration operations, including killing key figures of the enemy and destroying the enemy's command, control, reconnaissance and communication facilities. The Thor Commando under this brigade is the "best of the best". Formed in September 2011, this special operations force, "the most special of the special forces", should be able to "give the enemy a deadly blow at key junctures and critical moments", said Fan Xiaojun, the then political commissar of the airborne troops. The airborne troops also formed a combat support brigade, which consists of the former communication regiment, engineering detachment and chemical defense detachment of the former 15th airborne corps. In the age of IT-based warfare, supportive capabilities such as electronic reconnaissance, interference, communication, battlefield setup and opening, and various defense tasks take a very important position in battles. Therefore, forming a unified support brigade is necessary for combined combat. An air transport brigade was also formed, which consists of the former air transport regiment and airports. Public information shows that the PLA airborne troops were equipped with the Y-12 light transport plane in November 2016, which meant Y-12 will replace the Y-5C airborne training plane comprehensively to undertake tasks such as basic parachuting and daily parachute training. Generally speaking, when airborne troops conducted large-scale exercises and combats, the air transport plane unit would perform the transporting task. At present, more China-made Y-20 large transport planes are commissioned and have formed stable combat capability, and the Chinese airborne troops that once didn't have enough large transport planes are moving in the direction of higher level of integration and heavy equipment and stronger capability of maneuvering and fast response. Military analysts said that as the new airborne troops are reorganized into brigades, the brigades will be more professional and modular in the future, and each, assisted by the support unit, will be an independent unit that is able to undertake a battle-size airborne combat. "In this way, the airborne troops will have better maneuvering capability and can reach the destination in every theater. "According to Zhao Jinjun, deputy chief of staff of the airborne troops, this makes the input of troops more flexible and mobile either for independent combat or the combined combat of several theaters. At the moment, the new system and establishment of the PLA airborne troops are already in place. Under this framework, airborne vehicles, light large-caliber howitzers and assault vehicles will be provided for the troops step by step. As more large and medium transport planes such as Y-20, Y-9 and IL-76 are put into service, the airborne troops' combat capability will be enhanced significantly. Comprehensive transformation of the "flying infantry"
Airborne troops are the favorite of many militaries in the world because they are flexible in maneuvering, capable of abrupt operations and free from domain limitations. The Chinese airborne troops developed quite slowly in the 30-plus years from the early 1950s to the end of 1980s due to the backward equipment of the PLA Air Force and the traditional idea that "army is the most important service". They were strongly influenced by traditional army in that period and were called the "flying infantry". The fast deployment of the U.S. 82nd airborne division and the assaults operated by the 101st airborne assault division in the Gulf War in the 1990s taught the Chinese airborne troops an important lesson. It was also in that period that the airborne troops of developed countries adopted a new generation of heavy-duty equipment, which solved problems such as continuous input of heavy equipment and ammo-loaded air drop. This gave the Chinese military a strong stimulation. China'sCentral Military Commission listed airborne troops as a key unit and its development got on the "speed track". Following the requirement of accelerating the transformation and development of the airborne troops and enhancing their combat capability, Chinese airborne troops got on the way of heavy mechanization. China purchased several batches of IL-76 transport planes from Russia, the Y-8 fleet kept growing in scale, and a series of heavy equipment represented by the ZBD-3 airborne armored infantry fighting vehicle (IFV) were commissioned. The Chinese airborne troops, like the Army, witnessed the upgrading process from "motorized" to "mechanized" and then to "information-based" and became a new service integrating transport aviation, infantry, artillery, missile unit, armored unit and other professional technical services. According to some military experts, Chinese airborne troops are occupying an increasingly strategic position and role as they evolve from "single structure" to "multi-unit integration", from "specialized in specific aspects" to "all-domain combat", from "tactical cooperation" to "battle assault", and from "extensive operation" to "accurate strike". The new strategic positioning of Chinese airborne troops is that they are a strategic service in the national armed force system, a force of emergency maneuvering responsible for all-domain combat, and a strategic fist directly controlled by the highest command. According to Zhao Jinjun, such a positioning depends on the unique and irreplaceable features of airborne troops. They boast the highest maneuvering speed among all arms and services and can reach places that other armed forces cannot reach or cannot reach timely, so they are irreplaceable. Lieutenant General Andrei Kholzakov, deputy commander of the Russian Airborne Forces, said in an interview that the airborne troops of different countries had different positioning based on their own national defense strategy, and their ability to quickly meet the tactical or strategic goal was usually relied on by top military officers because in modern warfare, victory or defeat was a matter of second. In terms of the scale and equipment of airborne troops, the U.S., Russia and China rank the top three in the world, and the American and Russian airborne troops both participated in actual combats and are neck and neck in strength. Compared with them, Chinese airborne troops are inferior in equipment and experience, but they have made remarkable progress in recent years by following the American and Russian training standards. Since the 18th CPC national congress in 2012, Chinese airborne troops have moved faster in strategic transformation and achieved the breakthrough from light infantry to multi-unit integration, from "focused on rear combat" to "all-domain maneuvering", from traditional parachuting to integrated assault, and from motorized and semi-mechanized operation to mechanization and extensive IT application. In 2017, the airborne troops began full-process and systematic airdrop exercises the minute the reform and adjustment was completed. Heavy equipment airdrop is an important indicator that gauges the airborne troops' maneuvering and fire strike capability on the battlefield. The Chinese airborne troops have progressed by leaps and bounds in the field of airdrop and parachuting in the past 10-plus years. In 2000, they dropped 30 pieces of battle materials continuously; then they made technical breakthroughs and could ensure the airdrop of various vehicles and artillery; in 2008, they realized simultaneous airdrop of personnel and heavy equipment. At that point, the airborne troops primarily realized mechanized main battle equipment, equipment airdrop and all-round battlefield maneuvering. Since the 18th CPC national congress in 2012, the airborne troops began to implement the realistic training concept of combining training with actual combat in light of the CMC's requirement for "earnestly carrying out realistic military training". In August 2013, the airborne troops had the first mixed continuous airdrop of multiple types of equipment via multiple types of aircraft and massive group parachuting, indicating that they had primarily formed the capability of large-scale airborne combat. In June 2015, they carried out the first successful airdrop of heavy equipment at the altitude of 6,000m, breaking the bottleneck of mechanized combat on the plateau and filling the blank of heavy-duty airdrop above the altitude of 4,000m. In the fall of 2016, airborne troops had the first successful mixed loading and airdrop of all-terrain vehicles, a certain type of rocket gun and airborne IFVs above the altitude of 4,200m. In the past few years, the airborne troops have completed more than ten major exercise and training tasks such as the Mission Operation and Airborne Sword to verify the combat performance of personnel and equipment in complicated scenarios, and have accumulated a large multitude of combat data. "The form of war has changed under new circumstances, and the combat system, leadership and management system, establishment and equipment, combat tasks and models, and training approaches must change accordingly," Zhao Jinjun told the reporter, adding that this cannot be achieved by fighting one single war, so they have to organize realistic training in a realistic environment. Having clearly analyzed the form of war in the new situation, the airborne troops, according to CMC's requirement for the ability "to fight and win battles", put forth the concept of realistic military training for war preparedness. "We train like fighting real battles and fight battles like training, so training and realistic battle are exactly the same," said Zhao. America's Air Force magazine and Britain's Chinese Defense Today website summarized six stunts of Chinese airborne troops - paralyzing the enemy's command system, attacking its high-value military facilities, destroying its logistics support facilities, close-range combat at night, combat in dangerous terrains, and urban battle. These stunts are closely related with the environment faced by airborne troops on the battlefield. According to Zhao Jinjun, the rear battlefield is always the main battlefield for airborne troops, where they have to deal with difficult reconnaissance, communication, maneuvering and replenishment due to the unclear situation and unfamiliar topography. 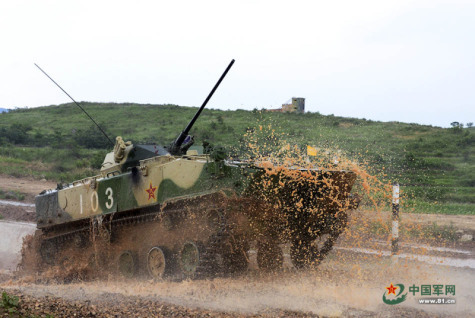 "We have to fully understand the missions, the ways to win airborne battles, the various opponents and the battlefield environment, and then determine how to exert our strengths, avoid our weaknesses and defeat the enemy", Zhao said. To improve the capability of survival on the battlefield, Chinese airborne troops improved the parachuting approach, so that the paratroopers can fire arms 400m above ground, thus enabled them to launch air counterattack. Moreover, the airborne troops are planning to foster the ability of vertical amphibious landing, namely sea-air combined operation, and are also training to take preemptive steps and secure key targets and penetrating enemy defense by means of surprise attack. Zhao Jinjun told the reporter that an excellent paratrooper is able to do far more than just parachuting and firing. In addition to all the skills of the infantry, they also need to learn to use all kinds of weapons and firearms and grasp the general skills of engineering, chemical defense, communication, reconnaissance and missile units. They also have to learn to drive various motorized vehicles, jump different types of parachutes from different types of planes, and survive in all kinds of environment such as mountain areas, plateau, island and forest. It is learned that the airborne troops have improved 24 sets of tactical and training methods and cancelled over 40 outdates training subjects in recent years, steadily enhancing their combat force. Heavy equipment is an important aspect that reflects the fire strike capability of the airborne troops. In recent years, assault vehicles and combat vehicles of airborne troops are successively commissioned. In the "Peaceful Mission - 2005" China-Russia joint military exercise, Chinese airborne troops successfully dropped the new type of airborne IFV ZBD-3 by batches. This marked a major breakthrough in equipment mechanization and IT application of the airborne troops and brought them to the age of heavy equipment. In August 2010, Chinese airborne troops dominated an exercise on the Qinghai-Tibet plateau as a main battle service for the first time, in which helicopters, airborne combat vehicles and assault vehicles were mobilized to demonstrate the capability of remote strike and all-round assault. Later the ZBD-3 airborne combat vehicle, a crawler-type vehicle, developed in series. Its chassis has much room for improvement and may give rise to a range of vehicle types such as airborne mortar vehicle, airborne rocket gun vehicle and airborne anti-tank missile launcher. Furthermore, the airborne troops haven't given up the "big artillery" tradition. Limited by air transport capacity and combat philosophy, Chinese airborne troops only had light artillery in the past, mainly mortar and recoilless gun, but now they are equipped with medium-caliber artillery, with the 122mm towed howitzer being the main battle gun, and are developing the large-caliber light artillery at a faster pace. At the Airshow China held in Zhuhai in 2016, a number of advanced airborne heavy weapons such as the most advanced 8×8 wheeled 105mm assault gun and 155mm howitzer were presented. The commissioning of large-caliber light artillery will further enhance the combat capability of Chinese airborne troops. The transport fleet in service of the airborne troops has evolved from medium and small transport aircraft represented by Y-7 and Y-5 to a rational layout of large, medium and small aircraft including IL-76, Y-8, Y-9 and Y-12. On July 6, 2016, the Y-20 independently developed by China was officially commissioned by the Air Force's aviation unit, marking a substantial step forward in the Air Force's strategic delivery capability. It is learned that the airborne troops and the Y-20 transport unit are already training for the airdrop of heavy equipment. China has seen notable progress on its heavy equipment airdrop capability in recent years, and Chinese airborne troops are able to drop anything that their foreign counterparts can, said Li Zhenbo, a senior engineer who used to be the director of the airborne troops research institute. As to whether airborne troops will develop in the direction of heavy or light equipment, the Russian lieutenant general Kholzako didn't think that was a conflict. Airborne troops in different countries have different tasks, which determine how flexible the airborne troops can be in actual operation. "In future warfare, it is the general trend to combine different services, and the mobilization of airborne troops will only be relatively independent," said Zhao Jinjun. In view of its development in the past 20 years or so, the Chinese airborne troops, while referring to the "comprehensive mechanization" of Soviet/Russian counterparts and the "air-ground integration" of American counterparts, are fostering their own characteristics and becoming more able to meet China's strategic needs.